Plymouth Argyle’s talented young side – the highest placed of the 54 teams in this year’s League Cup competition and with a 100% record in their last five games – made the long journey west as the clear pre-match favourites against a Mousehole side standing in 5th place in the Division below. But the hosts put on a tremendous performance of teamwork, skill and commitment to earn a fully deserved victory, their fourth ‘giant killing’ against higher-division opponents in this season’s Cup competitions and this time earning the title of Team of the Week in a SWPL public vote. This was a much anticipated and well attended contest between two teams noted for their passing style of football, and on a superb playing surface it was Kevin Nicholson’s men who outshone the Premier Division leaders in all departments. Argyle fielded their usual mixture of Academy prospects and players with first-team squad experience, while Mousehole, playing in their dark-blue away kit to accommodate the visitors’ traditional dark-green club colours, were without half a dozen regular squad members who were either cup-tied or injured. 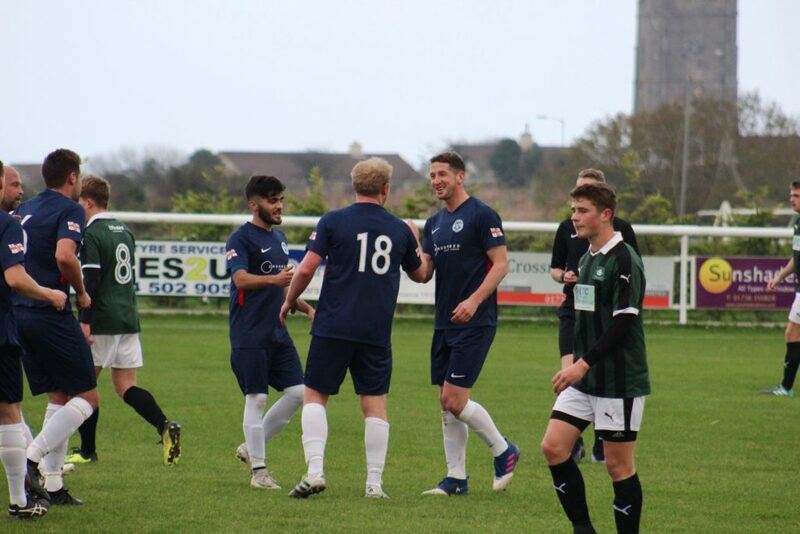 Argyle had progressed to the third round after a bye and a 3-1 away win at much-fancied Tavistock, whereas Mousehole had notched up away successes at Premier Division sides Newquay (2-0) and Sticker (4-0). Gerens James put Mousehole in the lead on 18 minutes, using his strength and know-how to hold off his marker before turning on to Billy Curtis’ floated cross from the right and firing home from 8 yards. And the same combination produced the second goal in the 52nd minute, this time with the aid of an error by goalkeeper Mike Collins, who misjudged a wind-assisted cross leaving Mousehole’s top scorer to nod into an empty net from a couple of yards out. Dom Angove had a quiet afternoon in the Mousehole goal, as his defenders closed the door on every half-chance created by the visitors. The one exception came on 27 minutes when Alex Battle – the leading scorer in the Premier Division – exploited a generous amount of space 25 yards out to drive firmly into the corner for an equaliser against the run of play. Two other Argyle players, Callum Dyson and Alex Fletcher, feature near the top of the ‘Golden Boot’ standings as part of an attack that has scored 86 goals in 21 league games, but they were rarely allowed a sight of goal throughout the whole of the 90 minutes. The result and performance indicates that Mousehole’s squad now has real strength in depth as well as continuity of playing style, which should serve them well over what promises to be a challenging but exciting winter period. Mousehole will not know their opponents in the League Cup quarter-finals – with those games to be played on or before 28th February – until the draw is made after the completion of the remaining third round ties on Saturday 8th December. Having just faced the team at the top of the Premier Division, The Seagulls now face the leaders of Division One West as they travel to Lux Park to take on unbeaten Liskeard Athletic this Saturday (24th), kick off at 3pm. Mousehole are currently 11 points behind the leaders with a game in hand. Having won their first ten league games outright, Liskeard were fortunate to come away from Penzance with a 1-1 draw last Saturday, after The Magpies played much of the game with ten men and even missed a potential match-winning penalty near the end. The following Saturday (1st December) it’s local derby cup day – Penzance v Mousehole in the first round of the Cornwall Charity Cup (2pm). Substitutes: Ben Musselwhite (for Adam Randall, 46), Owen Raven (for Andy Burn, 80). Scorers: Gerens James 18 (1-0), Alex Battle 27 (1-1), Gerens James 52 (2-1). Referee: Matthew Carney. Attendance: 118.